Whether you are planning a home or hospital birth, hiring a professional labor support companion is one of your most important considerations. In our opinion, all parents need the continuous support of a trained and experienced professional. Doulas are hired in addition to, not instead of, a primary care practitioner (midwife, physician, certified nurse midwife, etc.). Doulas provide emotional support, information, pain management and comfort measures as well as facilitating the participation of the father or partner. While some partners feel threatened by this idea, it's usually because they don't understand the doula's role in a birth. Most men have scant if any experience with the birthing process. One of the intentions of the doula is to include partners in meaningful ways so the mother can benefit from his support and love. Emerging fathers need support too, and having a doula there to help him know what helps and when to do it usually makes a tremendous difference. The birth of a child should be as enjoyable as possible for both parents. If you are choosing to give birth in a hospital there will be literally hundreds of procedures you to be aware of and knowledgeable about. If you are interested in having an advocate with you, some doulas provide this function as well. While the doula is there to support you in making decisions for yourselves, it often helps to have a knowledgeable and informative perspective. Avoiding unnecessary interventions is much easier if you feel fully informed on the available options. The doula will also go to your home in early labor so that you can stay calm and relaxed. You can often avoid unnecessary interventions just by staying at home for most of your labor. Choosing the person you are going to work with makes a big difference. You will meet beforehand and plan together in addition to being together during the birthing event. You can call your doula if you have questions. Often parents feel rushed or intimidated during their primary care practitioner visits and a doula can be address your questions and concerns. The doula should also have a back-up to cover for her just in case she can't make it to your birth. In the Chicagoland area, doulas usually charge a flat fee ranging from approximately $500 - $1500 per birth (for middle to very experienced doulas). Rates are based on levels of experience and knowledge and many have payment plans available. While insurance usually does not cover this service, it is recommended that you still submit a claim as some clients have successfully sought reimbursement. If you are challenged financially we can help you find a doula in training that will charge less than $500 per birth. Please feel free to contact us. There is a national certification process from Doulas Of North America (DONA) but keep in mind that not all doulas are certified and levels of experience and expertise vary irrespective of certification. They are not licensed by the state. Practice philosophy can vary a great deal so screen carefully to avoid disappointment. Read all contracts carefully and avoid anyone that says there will be no refunds if the doula does not attend the birth. If you have any questions please contact BirthLink. Be sure to check references before you hire any doula. You may also want to check with the Better Business Bureau and Google to see if there have been any complaints. See alphabetical listings below. Please contact the practitioner directly to schedule an appointment or if you have any questions. Be sure to let them know BirthLink sent you! Also see: Labor Monitrice. Matching you with the doula that is right for you! Grounded in evidence-based perspectives and offering mindful, compassionate and nonjudgmental support, Birthways doulas have exceptional experience and training. 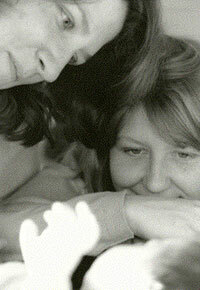 Senior doulas have attended hundreds of births, and mid-level or apprentice options are also available. DONA trained birth and postpartum doula, ICEA trained childbirth educator and Placenta Benefits trained placenta encapsulation specialist. I am committed to providing evidence based information and compassionate, individualized care for all birth plans.